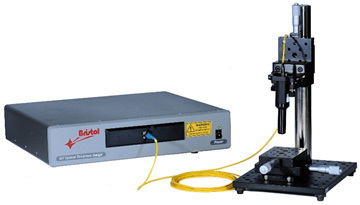 BRISTOL INSTRUMENTS, INC., a world leader in optical interferometer-based instrumentation, offers the 157 series Optical Thickness Gauge for the most reliably accurate non-contact thickness measurement available. Precision thickness information is critical in the development and production of a variety of materials. These include ophthalmic products such as contact and intraocular lenses, medical products including balloon catheters, stents, bags, and tubing, as well as specialty plastic films, adhesives, laminates, and flexible packaging. The 157 Optical Thickness Gauge offers straightforward operation, a rugged design, and affordability to satisfy the needs of both the R&D scientist and the manufacturing engineer. Confidence is ensured because every system is rigorously tested and certified with standards that are traceable to the National Institute of Standards and Technology (NIST), and backed by a three-year limited warranty. The model 157 employs Bristol Instrument's proven wavelength meter technology which is used in hundreds of research laboratories and manufacturing facilities around the world. 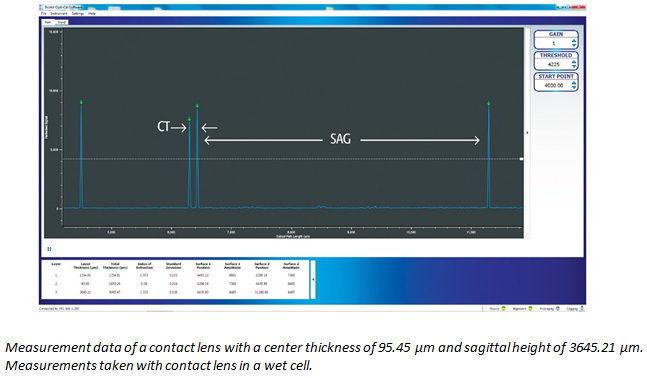 High accuracy and exceptional repeatability results in the most reliable non-contact thickness measurement available. Its straightforward operation, rugged design, and affordability make it ideal for the R&D scientist as well as the manufacturing engineer. The 157 Optical Thickness Gauge uses optical interferometer-based technology to measure the absolute thickness of a variety of materials. Light from an LED is sent to the material under test through an optical probe. Reflections from every surface (top, bottom, and internal) are collected and returned to the 157 system for analysis. Absolute thickness is calculated using an internal DSP and then displayed on a PC using a convenient graphical user interface. Or, data can be be transferred directly to special application software using the standard USB or Ethernet interfaces, in which case a dedicated PC is not required. The model 157 measures the absolute thickness of a single layer or multiple layers to an accuracy of ±0.1 µm and with a repeatability of ±0.02 µm. This performance is guaranteed over long periods of time by continuously referencing the measurement to a built-in HeNe laser that has a wavelength recognized as a standard of length by NIST. In addition, a unique interferometer design results in unmatched thermal stability to ensure that the system's accuracy and repeatability are maintained over the specified operational environmental conditions. In order to provide the confidence required for the most demanding testing applications, every 157 Optical Thickness Gauge is rigorously tested and certified with standards that are traceable to NIST. A three-year limited warranty also provides confidence in the long-term reliability of the system.